After what seems like a lifetime we are back on the road again, so to speak. The wings were clipped as we sat tight here in the UK waiting for a result of our visa application. And while this was happening we continued to get some great contracts. So it wasn’t all bad as the diary was definitely full and we’ve been busy zipping all over the UK enjoying life on the road. We’d loved our short time in Sweden a couple of years ago, so a few more days up in this part of the world had always been on the cards. The only negative we’d heard was, Copenhagen’s reputation for being one of the most expensive cities in the world. But thats all relative and we were really pleasantly surprised that it was no more than London and the wonderful people and experiences far outweighed the higher prices we may have paid at times. A city to best be admired by either two wheels or two feet and perhaps a sedate boat ride tossed in for good measure. The people were so polite, friendly and always ready to help and when they discover you’re from New Zealand you’re immediately made to feel even more welcome. Even their Crown Prince came down to the Southern hemisphere to find himself the perfect princess, a young Australian. Westend - this delightful street turned out to be the old Red Light District with all its old French Balconies where the prostitutes used to market themselves. We spent long days out exploring the city covering miles of footpaths, parks, gardens, cobbled streets, historic sites, museums, galleries and harbour views. Fuelled along the way by the local cuisine which consisted of an array of delicacies from one of the numerous bakeries, to a variety ‘smorrebrod’ (yummy open sandwiches on rye bread) usually with some type of fish and pickle and of course the very best coffee. Once again it wasn’t just the product that was so good it was the way in which it was presented and the time and commitment to detail that impressed us so much. Coffee Collective, our no 1 coffee shop of choice, felt more like you’d popped into a friends kitchen for a chat and a catchup while she took special care to make the perfect cup of coffee for you. The experience was the same every time and made it even better when we bought some delicacies from Meyers Bageri, (the bakery across the street) and took them over to enjoy with our coffee. The Norrebro district with its trendy multicultural neighbourhood turned out to be such a good spot to base from. Whether it was the vibrant side street of Jaegersborggade with not only our favourite coffee shop but lots of brunch spots, small boutiques with quirky new designers and the green oasis of Assisters Cemetery. Here is the final resting place of the famous Danish fairy tale writer Hans Christian Andersen which is surprisingly low key as is the whole cemetery, more of a garden and quiet green area to relax and picnic in or just enjoy biking/walking through. Cycling in Copenhagen is a way of life and if you judge that by the look of the people its an absolute winner. Not only are the majority of the cyclists incredibly good looking but they also look lean, healthy and happy. (I think that comment may be biased, as it’s based on David admiring all the stunning 6 foot tall, blonde, beauties that were whizzing along, on their upright bikes, often in their high heels and short skirts.) The Danes have always had a love of cycling but that has evolved over the years and the need to control congestion, traffic accidents, pollution etc has contributed to change. So with the help of some political initiatives and conscious marketing they have created a livelier, cleaner city that draws a cross section of people from all walks of life and age groups out onto the streets. Cycling is now associated more with positive values like health and freedom and has even become a symbol of personal energy. Denmark has a population of just over 5.5 million people and consists of over 406 islands and is generally flat with no big mountains to climb (another favourable point for the cyclists). 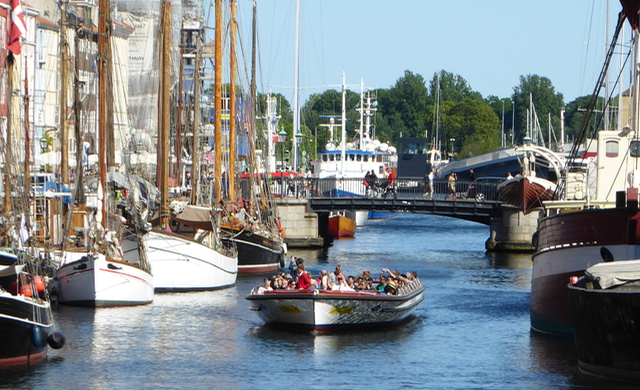 The canals add to the charm of Copenhagen, and surprisingly the water is even clean enough to swim in, and some of the 600,000 locals do all year round!!!! Now thats hardy folk!!! The Sandemans Free walking tour was once again a good choice, full of some fascinating history and local knowledge tips and met a delightful girl from Romania with plenty of passion for her own country. The Tivoli Gardens was a busy as ever - founded in 1843 it the second oldest amusement park in the world. Amazing to see it here right slap bang in the middle of the Cultural District alongside Palaces, Museums, Architecture and Art Centres. Tivoli, the 170 year old amusement park is as busy as ever. A quick saunter over the bridge, along the canals to one of Copenhagen’s oldest and best preserved but very colourful areas, Christianshavn, just had to be done. The green, car free area of Freetown Christiania, was established back in 1971 by a group of hippies squatting in the former military barracks. It’s still described as a large commune, with about 1,000 people making the colourful 80 acres here their home. It seems to be regulated by its own special law and police are not allowed in. But we were assured by the locals then even though we saw masked men selling drugs on the street and a few other dodgy characters it is probably safer than many other areas of the capital. The view from the top of The Round tower, a 17th century tower and observatory in the city centre was great. The 209 metre equestrian staircase in the tower makes the walk up easy (just a gentle spiral staircase) to the oldest functioning observatory in Europe. Also adjoining the tower, is the Library Hall which had a wonderful photographic exhibition by local photographers giving you an insight into everyday Danish life. Even Copenhagens most famous tourist attraction, Hans Christian Anderson's Little Mermaid, was worth visiting. She’s a little thing as you can imagine but theres no denying she can certainly pull a crowd! We took a train about an hour up the coast to Helsingor, a small Danish town built on the closet point to Sweden. The imposing Kronborg Castle or better known as Hamlets Castle is the star attraction. Shakespeare based his play here at Denmarks most famous castle but its still not known if he ever set foot in it. This lavish Renaissance castle was first built in 1420 but has since been rebuilt after burning to the ground. The small town of Helsingor was once one of the most important towns in Europe and all foreign ships passing through this stretch of water into the Baltic Sea having to pay a toll (known as the Sand Dues) to the King at Kronborg Castle. At one stage this constituted almost two thirds of Denmark’s income, making this narrow strait between Denmark and Sweden very valuable. The Sand Dues were abolished in 1857 after an international agreement with all sailing nations but you can still spend that toll money and enjoy the new the Maritime Museum in Helsingor. Designed by a local Architect who was also responsible for the Sydney Opera House, almost all of it is underground as not to impair the sight of the historic castle. Another great find was the Louisianna Museum of Modern Art just back down the coast a few kms in Humlebaek. The parklike situation that it is home to the Museum is an ideal setting to display the numerous modern sculptures. Made all the better as you can gaze beyond the beautifully manicured lawn to the sound that divides Sweden and Denmark. A perfect place to have lunch, picnic or at least linger a while over a coffee admiring the surroundings. Inside are some amazing collections of modern and contemporary art by international and local artists, by well known masters but also by up and coming artists. It really was a very special place, that we were delighted to have found, thanks to our Airbnb host Rasmus and his suggestions. As we fly out after five fun days our lasting impression of Copenhagen and maybe Denmark a very happy one. We can definitely understand how the city was voted one of the most liveable city’s in the world. Perhaps there’s something to say for high tax’s and ……………..